Bosasa CEO Gavin Watson emerged as the absolute kingpin in the Bosasa empire of bribes, intimidation and cold hard cash at the state capture commission of inquiry in Johannesburg. 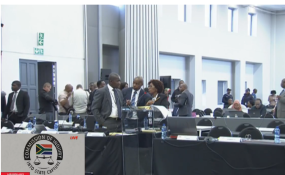 During former Bosasa executive Angelo Agrizzi's second day of testimony at the commission on Thursday, a video clip was presented as evidence and ripped open the secret workings of Bosasa's world. In it, Watson could be seen counting money and telling an employee who he should make monthly payments to. Asked why the employee took the video, which was apparently recorded in 2017, Agrizzi said "people would be disposed of". "If you got to know too much, people would get disposed of. I know because I used to do some of the disposing. If you have served your purpose and you started raising your voice that 'I don't want to do this anymore' then you would be easily terminated." "We lived in an environment where it was very dangerous," Agrizzi said. He added that if a person did not do what they were told or if they questioned it, they became "problems". "And problems would have to leave and have their salaries cut. We were constantly told that we were white males and we would not find jobs anywhere," Agrizzi testified. In the video clip, CFO Andries van Tonder could be seen moving a box of money from one vault to another. The video then showed Watson counting stacks of cash, reaching R1m. Agrizzi explained the system of handling money which was used for "bribes" at the Bosasa headquarters. He said it began with the delivery of the cash to the headquarters, packing it and reconciling it into a vault. The cash would then be counted and this would be followed by a notification from the director that the money was ready for the intended recipient. Agrizzi told the chairperson of the inquiry, Deputy Chief Justice Raymond Zondo, that every contract Bosasa received was "tainted with bribes and corruption". He said once contracts were awarded to the company, "somebody would have to be looked after". Zondo asked if he had never seen the bags carrying anything else but bribe money while he was employed at Bosasa, Agrizzi said: "Chair, I can confirm that." The former chief operating officer, who is currently blowing the whistle on corruption, told Zondo that in the early years, cash was drawn from the banks but that became "too much". He said he also used to receive money and did anything he wanted to. "It wasn't reflected in the books. That was what was given to me just to 'keep you happy'." The commission's head of legal team Paul Pretorius asked Agrizzi why senior management received cash as well. "It kind of buys loyalty. You feel important. You are caught up in a cult. It is a trap. Bribery is a trap. You raise your standard of living, you raise everything to that bar and as soon as you start complaining about it, it gets taken away from you," Agrizzi said. "You don't entrap somebody for life when you pay them once off because they take their money and they go and do something else but once you start paying people bribes on a monthly basis. For as long as they are there, you control them 100 percent."